Summer or winter, there's plenty to keep you active! In summer the area lends itself to mountain biking, mountain walking, canyoning, climbing, via-ferrata, pony trekking and more... and in winter we are based in the heart of the Neiges Catalanes, offering the ideal surroundings for downhill, cross-country or touring skiing, snowshoeing or even husky sledding. The ski area Espace Cambre d'Aze is next to our property and within easy reach are five others including Font Romeu and Les Angles, with Andorra being an hours drive away. We are renowned for our mountain bike guiding in the Catalan Pyrenees. For more details please take a look at our dedicated website www.altitudeadventure.com. The Mouli del Riu is situated on the GR10 and surrounded by fantastic walking. It is possible to take a day hike around the Cambre d'Aze massif, walk one of the many beautiful mountain valleys to a high mountain lake or take a more gentle stroll in the woods. You can immerse yourself in the world renowned valley of Eyne with it's huge array of flora, some that's even unique to the valley. Other popular walking areas include the Valley of Caranca with it's impressive gorge and cabled path network and the area surrounding the Bouillouses lakes, with Carlit (2921m) being the highest mountain in the area. Beautiful mountain streams and lakes are all in easy reach offering both Fly and Course fishing of a very high standard. There is a bolted sport crag next to our property, the 'Rocher de St.Pierre' and just 20 minutes away is the famous bouldering area of Targassonne. The Les Angles 'Parc Animalier' is worth a visit young or old, you can see all the Pyrenean animal including bears and wolves. In the same area is Lake Matamale, where you can walk or cycle around the lake, fish, sail, paddle or just relax. For the more adventurous there's archery, a high level rope course or 'dry' husky sledging in the summer months, it's a great venue for all. 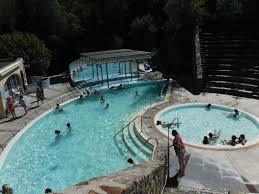 Thermal baths - the area is famous for the hot mineral baths at St. Thomas, Llo and Dorres. A great way to enjoy the warm waters and all the benefits of a spa, some of which have additional hamman facilities. World Heritage UNESCO sites - the Fortifications of Mont-Louis dating back to the 17th century and is still used for military purposes today. Secondly, the Ramparts of Villefranche-de-Conflent, a fantastic medieval walled town and starting point for the Yellow Train. 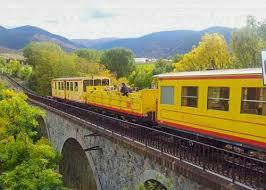 Yellow Train - An amazing journey that passes through spectacular gorges, tunnels and over bridges to highest railway station in France. Puigcerda - Just across the border into Spain discover this pretty hillside town with good shopping, restaurants, bars and a taste of Spanish culture. Four Solaires - Mont-Louis and Font Romeu, spectacular constructions to capture the power of the sun to generate electricity, tours available.